Castrol EDGE with SYNTEC power technology is a unique and proprietary formula that reduces volatility and provides superior protection for critical engine parts helping your car to function optimally at maximum power. Castrol EDGE with SYNTEC neutralizes acids in your engine that can cause rust and corrosion on vital engine parts such as cylinders, bearings and hydraulic valve lifters as well as providing stability and endurance under extreme conditions (heat, load, speed) that can cause conventional oils to break down. Best of all, EDGE can be used with confidence in every gasoline-engine passenger car, new or old, regardless of oil previously used. "Engineered specifically to meet the Volkswagen engine warranty requirements, exceeding VW 502 00 and 505 00. Exceeds all car and light truck manufacturer's warranty requirements for the protection of gasoline, diesel and turbocharged engines where API SL, SJ, SH, CF or CD is recommended. Porsche approved and also exceeds European ACEA: A3, B3, B4, MB 229.3, MB 229.1, BMW LL-98. Meets the engine protection requirements of Volvo, BMW, Mercedes Benz and ILSAC GF-3 for API Certified Gasoline Engine Oils". "Provides the widest range of protection available. SAE 5W-50 delivers exceptional cold temperature pumpability for rapid oil circulation at start-up and provides a thick oil film for ultimate wear protection. Exceeds all car and light truck manufacturer's warranty requirements for the protection of gasoline, diesel and turbocharged engines where API SM, SL, SJ, SH, CF or CD is recommended. Exceeds European ACEA: A3, B3, B4; Ford WSS-M2C931-A and the engine protection requirements of GM 4718M, ILSAC GF-4 for API Certified Gasoline Engine Oils". All Castrol trademarks & copyright material belongs to Castrol (USA). 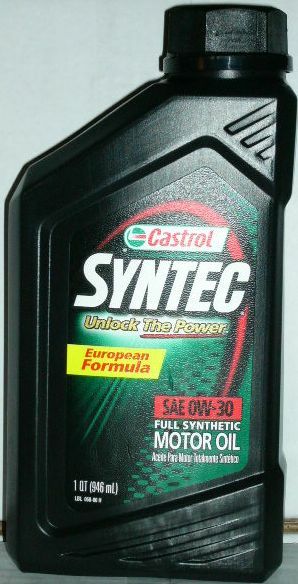 The manufacturer of Castrol synthetic oils.